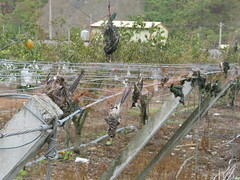 A common site in rural Taiwan is netting surrounding orchards to protect fruit trees from birds. The growers' desire to protect their crop from birds is understandable. 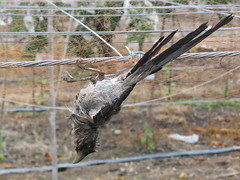 Many growers erect heavy netting structures around their orchards or fields in an effort to minimize their losses to birds and some larger insects. Some of this netting has a shade value, too, and is easily visible to birds. 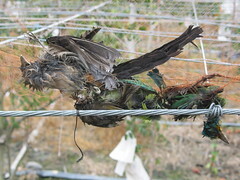 However, all too often, one sees cheap light plastic netting very similar to the mist netting used by ornithology researches to catch birds for banding purposes being used. This light loose net appears almost invisible to birds and serves to kill rather then deter birds trying to get at the fruit. 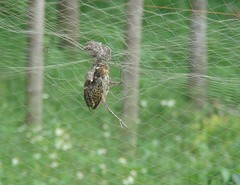 Birds unknowingly fly into it and their feet get tangled. 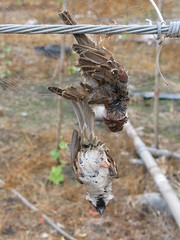 The bird then dies an agonizingly slow and painful death of dehydration under the hot Taiwan sun. Where does the right of the grower to protect a crop become the right to kill indiscriminately? Where does the grower move from protecting to trapping? 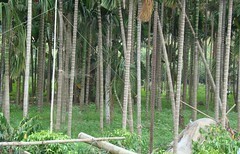 Where does the understandable protection of a crop become a license to knowingly kill wildlife? Surely, the erection of nearly invisible netting with the capacity to trap many birds is not a responsible method to "protect" a crop! Regardless of the rights of growers and farmers versus the protection of wildlife and what the various acts do and do not allow, it would appear that for now, thousands and thousands of Taiwan birds will continue to die agonizingly slow deaths under the hot sun as growers "protect" their crops.